This Culver City hotel wedding was an amazing event. I simply love this couple. There are so many amazing photographs that I captured the became part of my portfolio. I only wish I could show them all here, but it would appear repetitive to you to do so. For this particular image, of the bride and groom first dance, I was in an extremely challenging situation. First of all, the room where this was photographed is very small and barely had enough room for the bride and groom and their guests. In this crowded little room, surrounded by hundred guests, I took the expected photograph of the bride and groom as they danced in front of their friends and family. However, I wanted this reception dance to be something more. 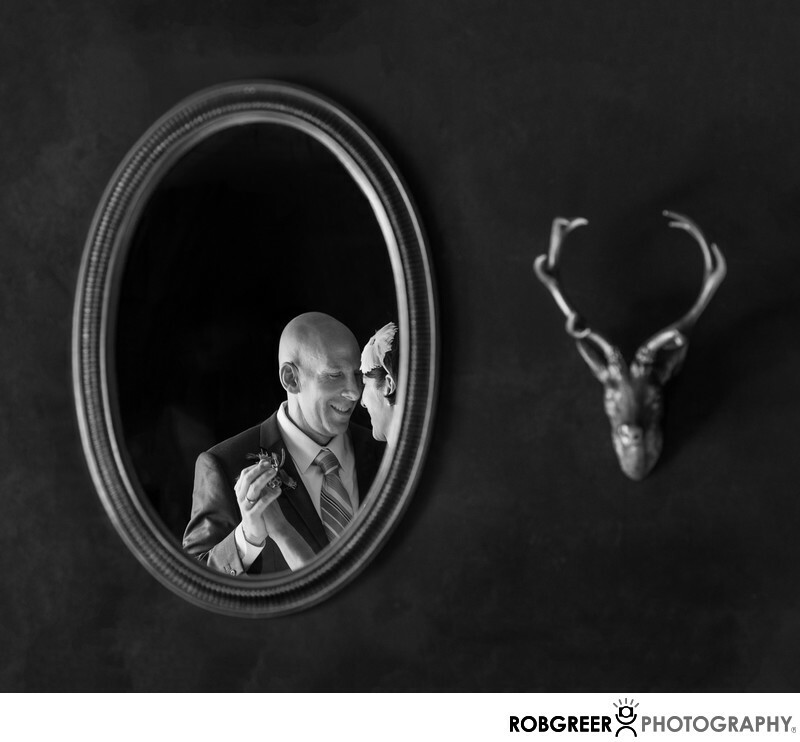 As a newly married couple danced, I noticed that they would sometimes appear in a reflection of a mirror above the fireplace. I instantly realized that it would make an amazing photo if I could capture them perfectly in that reflection. Complicated the matter was the fact that the wedding guests were also reflected in that mirror. So I found one angle where I was relatively low to the floor where the wedding guests were hidden and yet I would still occasionally see a reflection of the bride and groom. I eventually ended up with this particular capture, but I was never wholly satisfied by it because I don't have a clear view of the bride's face or her upper torso. That being said, wedding photography is imperfect and sometimes you are stuck with uncontrollable situations we must simply make the best of it. That being said, I'm very happy with the image in general as it celebrates a special moment between this newly married couple. This photograph has received several awards including a Fearless Award from Fearless Photographers and a Silver Award from the 2014 WPPI Print, Album & Filmmaking Competition. This particular photograph also hangs on my wall in my media room where I meet with clients every day. This Culver City hotel is located in Culver City, California. Phone: (310) 558-9400. Website: http://www.culverhotel.com/. Contact Person: Milena Alumni, (310) 838-7326, milena@culverhotel.com. Location: 9400 Culver Blvd, Culver City, CA 90232. Keywords: Culver City (6), Culver Hotel (6). 1/60; f/4.5; ISO 1600; 130.0 mm.